During my recent trip to Myanmar I have visited several reclining Buddha and one of them are in Yangon city – the Chauk Htat Gyi Pagoda. 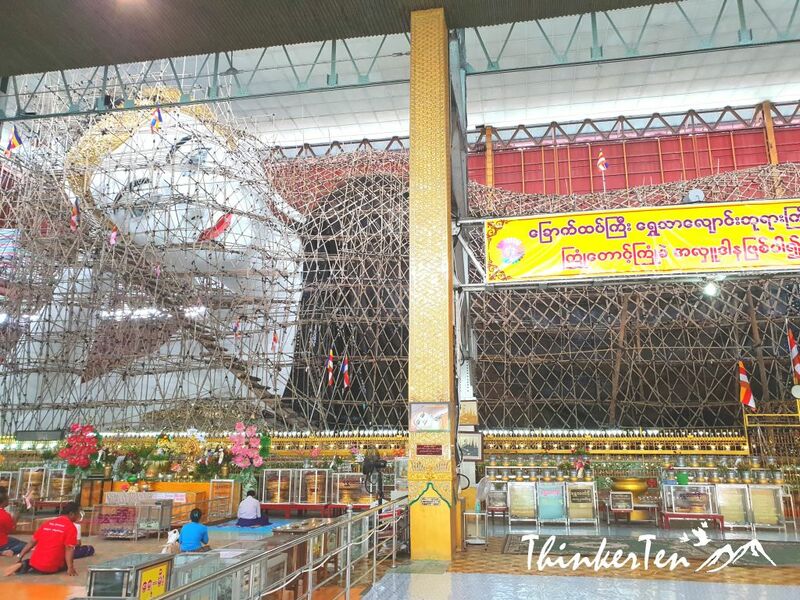 The reclining Buddha in Chauk Htat Gyi Pagoda is huge which measure 65 meters long & 16 meters high as compared to the Bago Reclining Buddha which is slightly smaller. This site would be the second most popular site after Shwedagon Pagoda. Too bad the reclining Buddha is under maintenance in September this year during my visit so there is no good picture about this beautiful Buddha image. 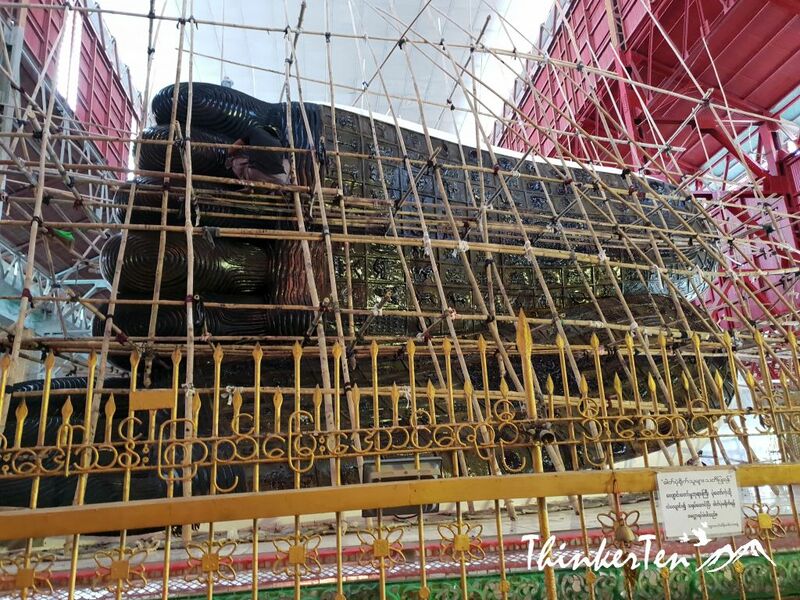 The original of the reclining Buddha is wearing the golden robe but since it is under maintenance, you see black all over. What made the reclining Buddha here so special is the make up used on the face of the Buddha. Even it is under maintenance, you are still able to see the very white face, red lips, blue eye shadow and red finger nails. 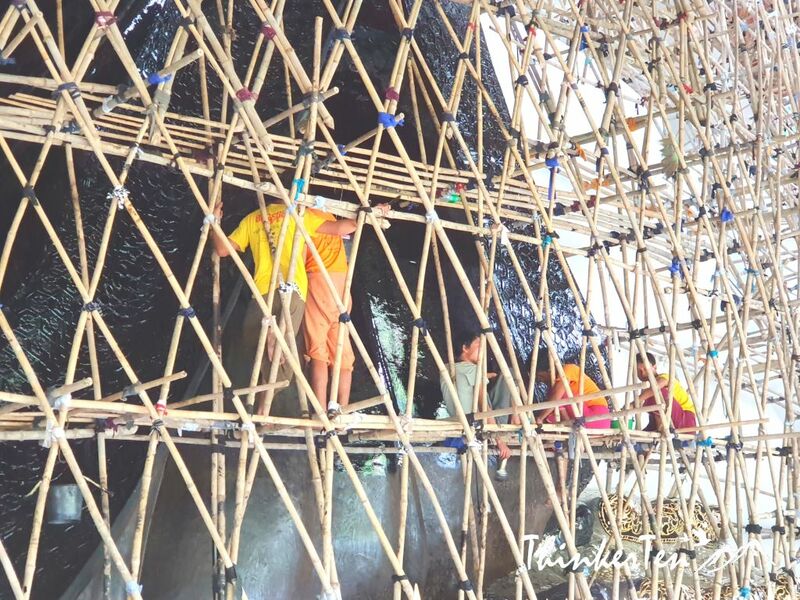 Workers are doing some maintenance at the Buddha body. There are plenty of detail on the foot of the reclining Buddha and each symbols represent something and all are being stated at the board next to it. Thai tourists are the majority here! Even though the temple is still under maintenance, there are still other groups of visitors visiting. I notice there are many visitors from their neighboring country such as Thailand. Thais visitors are also devoted Buddhist so it is quite common to spot them paying respect at the reclining Buddha and other temple pagodas around Yangon & Bago. Buddhist people usually pay their respect to the Reclining Buddha with burning incense sticks and offering flowers. You can purchase the incense sticks and flowers outside the temple. 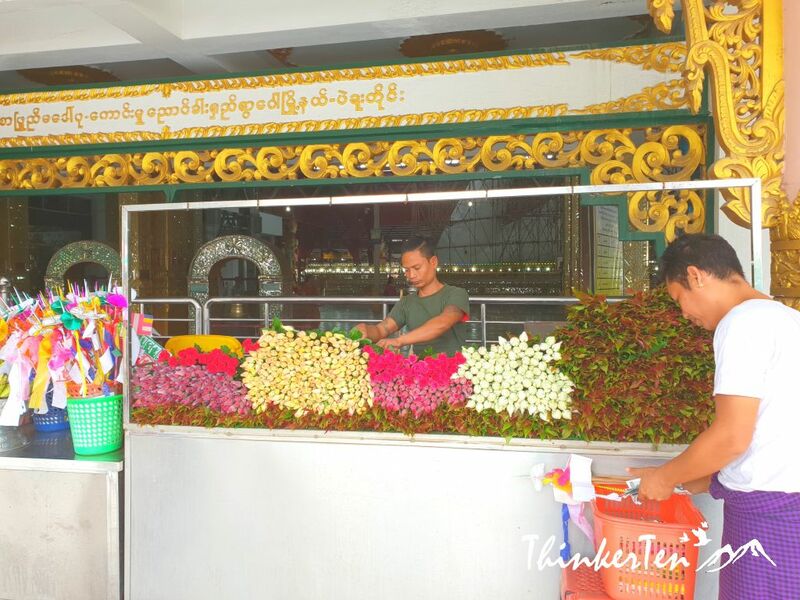 Outside the temple pagoda, there are several stalls selling local souvenirs such as cheap jade, Thanaka powder (the yellowish power for face) and some other trinkets. Do bargain before you pay. At the entrance of to the temple pagoda, you see caged birds. These caged birds are not for eating but you can buy from the cage-owners and released them and at the same time make a wish for health or good luck. Each bird cost about 500 Kyat (USD$0.30) each to be free. It is so sad to see the cage-owners taking advantage of the Buddhist practice and making money from these poor little birds. There is no entrance fees to enter the temple. However no shoes, no socks and shoulders & knees needed to cover up, including men. Bring along some wet tissues as you will need to clean your feet after walking at the pagoda. There are wet birds’ poo that you may accidentally step on to. The reclining Buddha in Chauk-htat-gyi Buddha Temple Yangon is huge and it has very heavy make up; white face, red lipstick, blue eye shadow and red fingers. It is one of the most beautiful reclining Buddha I have ever seen but I still prefer the reclining Buddha with little make up as it appear more natural and friendly looking. I have read a lot of good travel stories about Myanmar and this is one of them. Rich in history and culture are one of the reason why this place is so appealing to me. Thanks for the great tour even on just pictures. Myanmar is also one of the cheapest place to travel in Asia. Things are still very affordable compare to Thailand and Vietnam. What a beautiful post, I have never been but would love to visit. I especially like free the caged birds. I love the concept of letting them go and making a wish. I was a little sad though, thinking they might need fewer birds in the cages. Most of all I would love to see the reclining Bhuda up close. Thanks for your comment. 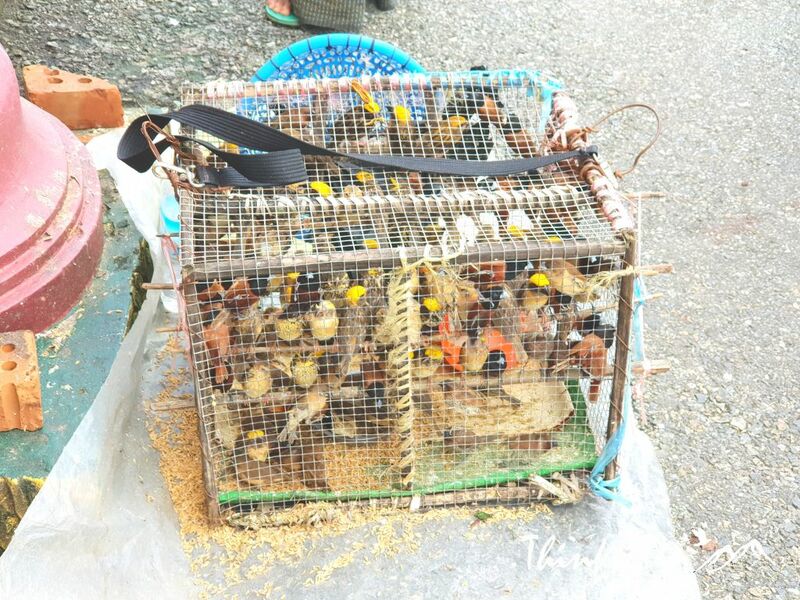 I too was sad to see so many of these birds being kept and live in a small cage, waiting to be sold and let go. Wow, that looks really awesome – we’ll be sure to check it out if we ever head there, thanks for sharing! 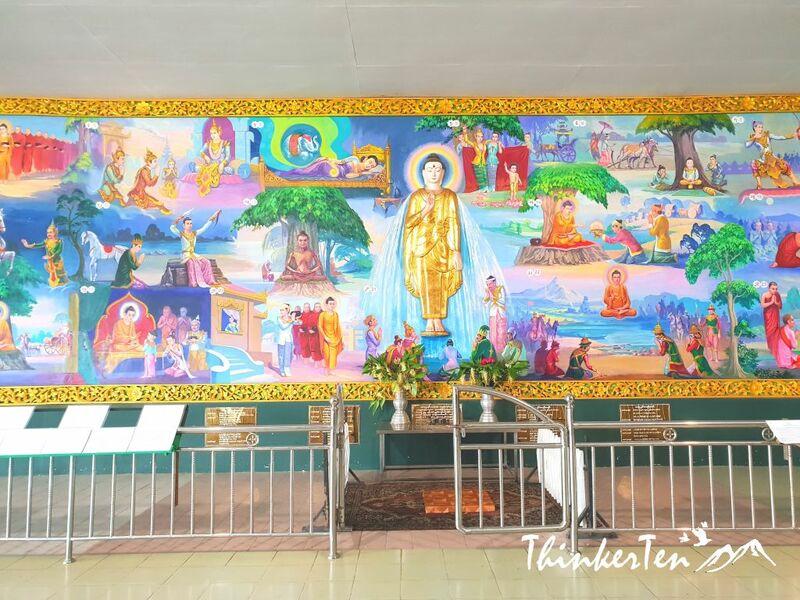 The reclining 65 meters long and 16 meters high Chauk Htat Gyi Buddha image is wearing a golden robe, hence making it looking super stunning. I’m with you on feeling sorry for the poor little birds. I would definitely buy some to set free; not because I believe in the ritual, but because I would want them to be rescued. That’s so kind of you and I guess many would do the same too. And let’s hope not to be caught again. The temple would look even better if it is not under construction. I guess it going through a facelift. What an awesome destination! I, too, am a little sad for the birds in the cages. Such a shame to do that for profit, ritual or not. I too feel sorry for these poor little birds and not sure how long they will be kept in this tiny little space. 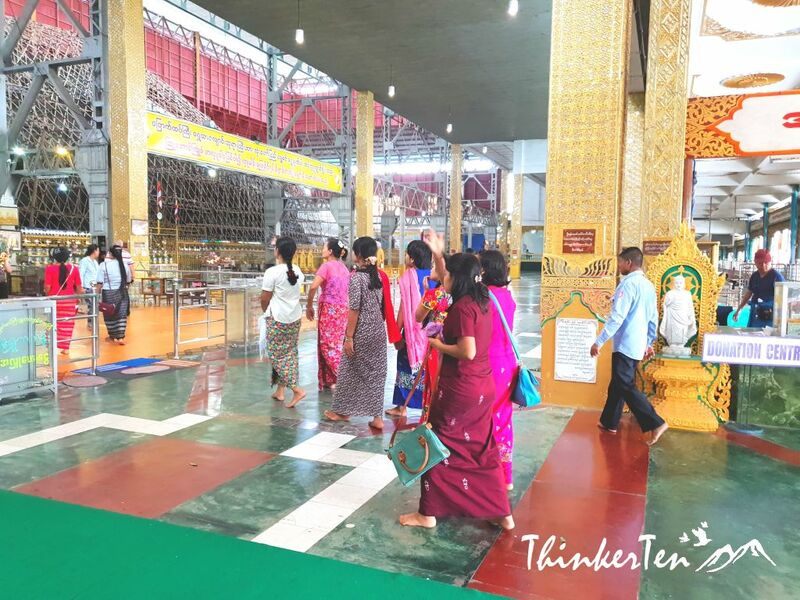 The temple is in Yangon and people usually include this temple when they do Swedagon pagoda. This temple looks like a beautiful place to visit!! Even though it’s under maintenance you can still see the beautiful face!! The mural behind the temple still looking pretty awesome. And there is a story behind it if you look at the mural carefully. I’d really love to visit historical places like this. This temple looks really awesome and full of history. Yangon Reclining Buddha is full of history, first built in 1907 but later there are few restoration and one done in 1966 and additional 5 meter long were added. There is a similar reclining Buddha indoor at Bago city, about 2 hours drive from Yangon too, it is called Shwethalyaung Buddha. Pretty much the same as this one. Both situated indoor. I had no idea about this temple. Soulds like you had an amazing experience. 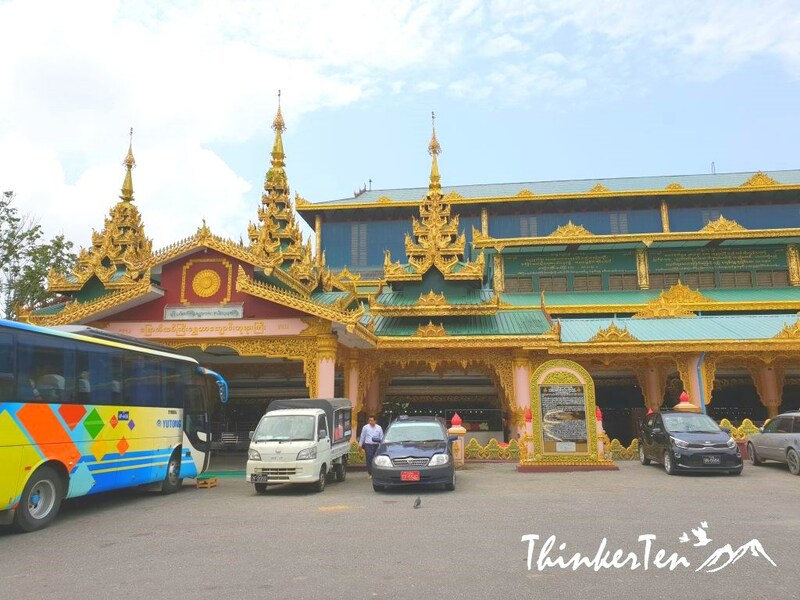 This temple is one of the important temple in Yangon city, anyone who is doing Yangon city tour will include this reclining buddha in their itinerary. Such an amazing place to visit! The temple is beautiful, and full of so much symbolism in every place you look. You are right, one place you may want to pay extra attention is the Buddha foot. It has many small sysmbols written on it. This is such a great post. Looks so beautiful there, it’s seems so adventurous and fun. Thanks for sharing! I love how there are several small shops nearby selling souvenirs, do remember to look for small trinkets there. I find souvenirs sold near the temple is cheaper at the Scott Market Yangon.